American Wolf: Big Little Elvises. 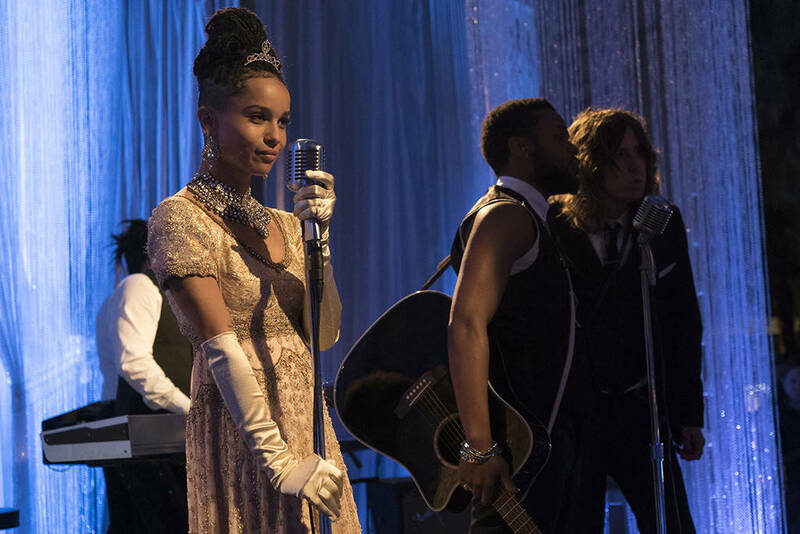 Last night I finally got caught up with Big Little Lies & like so many others, I was shocked--SHOCKED!--by the revelation in the finale: THERE WAS SO MUCH ELVIS! I have never seen Elvis embodied so thoroughly, so accurately, so lovingly, & with so much variety, as here & yet in a way that was completely tangental to the main plot. Which is to say, if you take Elvis out of the story, the story remains entirely intact. Based on the Liane Moriarty novel of the same name, Big Little Lies follows a group of deeply unhappy women in Monterey & the darkness that lies beneath their seemingly idyllic & lavish California lives. 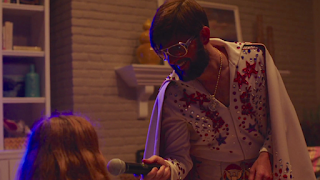 The fact that the climax occurs at an Elvis & Audrey trivia night (dads dress as Presley, moms dress as Hepburn) for their children's school is somewhat incidental; it could have happened at a normal dress-up fundraiser. Perhaps it was a statement on their rich lives or post-'60s masculinity & femininity, or maybe it was an excuse to get that spooky-but-awesome line of Audreys used in the opening montage. 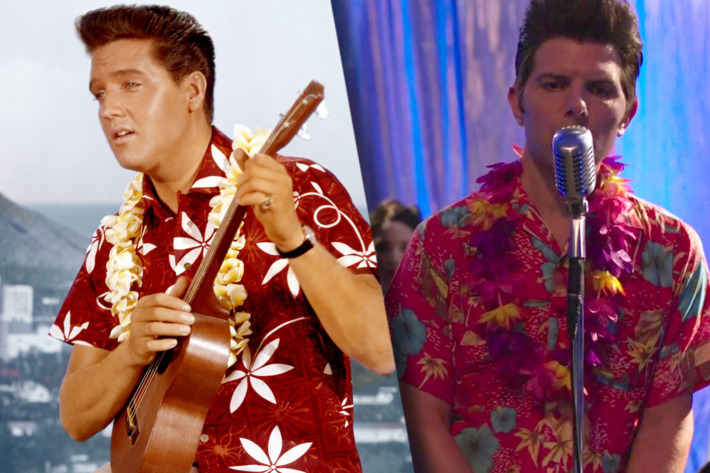 At any rate, someone on the show LOVES Elvis because they got things done with so much loving detail that it made me wonder if every dad in Monterey was an Elvis expert. I mean, the show could've just as easily put everyone in jumpsuits & nobody would have faulted the show, let alone noticed. &, as an added bonus, there was a Elvis singing contest that three of characters entered, which meant that Elvis songs were sang throughout. But this finale episode was different, & spoke to the ubiquity & pop culture saturation of Elvis in a way that no other modern figure can touch. Is there anyone else who is so iconic in so many different looks from so many different eras? So let's take a look, with a special thanks to Vulture, who already briefly mined this territory & from whom I lifted the pictures below to save time, energy, & sanity (thanks, Vulture!). Let's go in chronological order...of Elvis! James Tupper as Nathan Carlson As Jailhouse Rock Elvis (1958). 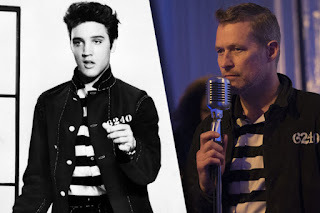 Confident & cocky James Tupper's Nathan Carlson chose to be Elvis in Jailhouse Rock, the film in which Elvis plays Vince Everett, a confident & cocky prison inmate who, rashness aside, is a decent guy underneath it all. Pretty good choice for macho, salt-of-the-earth Nathan, with a costume that's correct down through the stenciled 6240 prison number. Only strange part is that he doesn't actually sing "Jailhouse Rock" in the contest. After an earlier scene finds him testing out the brooding "Burning Love" & "Trouble" but he ends up crooning "How's The World Treating You? ", a lackluster ballad from Elvis's second album Elvis in 1956. Of course, his song seems to occur during the dramatic murder sequence, so maybe it was put in to represent a voice of fate, although others hear it as a diss track to his rival Adam Scott's Ed. Still, it's a weird choice since only the most devoted Elvis fans would've known it--in real life, the dance floor would've been filled with the idle chatter of the disinterested. Jeffrey Nordling as Gordon Klein As Gold Lame' Suit Elvis (1959). 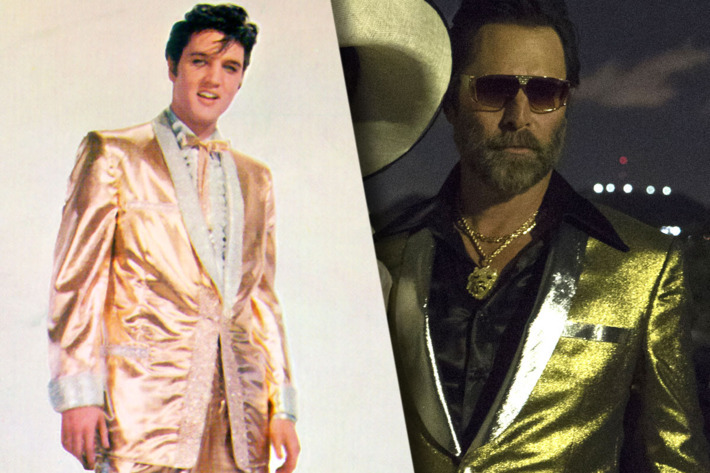 Jeffrey Nordling's Gordon Klein takes on his version of Elvis's gold lame' suit, which he wore on the cover of 1959's 50,000,000 Elvis Fans Can't Be Wrong: Elvis' Gold Records, Vol. 2. It feels like a pretty flat choice for a pretty flat character: His main appeal is his massive amount of money; it's hard to figure out why else Laura Dern's Renata would put up with him otherwise. He's a drip in search of a backbone, but he's rich so, sure, why not, do the gold lame' suit thing? 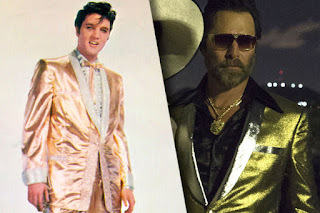 It's also the least-accurate of the costumes, what with the black undershirt & gold chains that Elvis wouldn't wear for at least another decade. & he didn't even bother to shave his beard. Adam Scott as Ed Mackenzie As Blue Hawaii Elvis (1961). After an earlier scene teased us with Adam Scott's Ed Mackenzie wearing a '70s Vegas jumpsuit costume & crooning "One Night" before his daughter suggests the less-obvious (& less-good) "Pocket Full Of Rainbows." Based on this, I assumed Ed would be dressed in a jumpsuit & singing "Rainbows," but he ended up surprising us all. He instead shaved his beard (! ), slipped into a Hawaiian shirt & lei (after all, Ed did say that he loves costumes). For the talent competition, Ed sang a lovely rendition of "The Wonder Of You," a beautiful song that actually did date from the jumpsuit era. Like everyone else who was watching, I wondered if it was/wanted it to be Adam Scott singing, but alas, it was not. Carefully sung as a tender ballad (Ed is smart enough to know that no one could touch Elvis's overwrought storm of a reading), it spoke of his simple devotion to Reese Witherspoon's Madeline, who gets it & is so touched that she cuts out in the middle of the song. We are left to assume that Ed Mackenzie is the only nice person with a y-chromosone in Monterey. 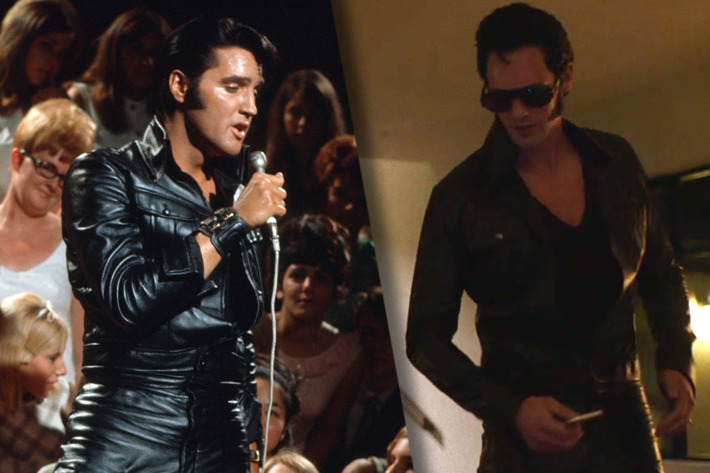 Alexander Skarsgard as Perry Wright As '68 Comeback Special Elvis (1968). Oh yes, & Bonnie. 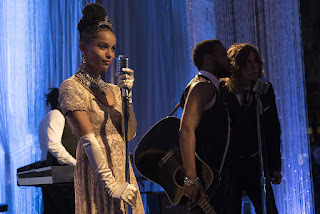 Zoe Kravitz's Bonnie is the only Audrey Hepburn to sing at the event, as she croons a beautiful rendition of "Don't," Elvis's last single before he went into the Army. She is also the only actor who didn't have to lip-sync to another singer (as the daughter of Lenny Kravitz & Lisa Bonet, she didn't need to). She gives a performance that is completely sultry & feminine, reminding you just how gentle Elvis could be to impress the ladies. It is also a reminder of how great the oft-overlooked "Don't" is. & although I can't find a picture of it, Santiago Cabrera's Joseph was a great '50s Elvis, dressed in the black-&-white suit Elvis often wore onstage & on TV. 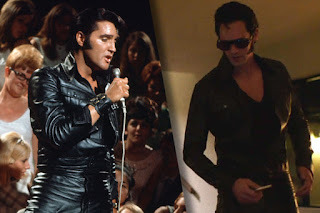 Out of all the actors, he is the one who naturally looks the most like Elvis, so for him, it felt like less of a costume than as a second skin. Given his stage background, one wonders if crooned elsewhere in the night too. Maybe he too was planning to sing "The Wonder Of You" to Madeline, although "Suspicious Minds" would've been the more appropriate choice. I also love the Elvises that we only saw glimpses of--the African-American purple Vegas Elvis who we see sing the end of a slow-burn "Treat Me Nice"; the military Private Elvis we see in one shot as people are walking in; all the half-assed Elvises who simply threw on glasses & or fake sideburns because they didn't care enough to do any better. & perhaps that speaks to the depth of the Elvis well. Iconic & versatile as she was, Audrey never had a chance against Elvis. Most of the women were variations on Breakfast At Tiffany's with a few My Fair "Ladies" thrown in, although I was rewarded in a long-shot of a Sabrina. For so many different men to delve into so many different Elvises, it begs the question, if you were attending this party, which Elvis would you go as? Or more directly, which Elvis are you? I've often held that Elvis is a figure like William Shakespeare or Abraham Lincoln--we project onto him how we would like to see ourselves. Much to my surprise & delight, the finale of Big Little Lies showed what a multi-layered & multi-faceted exercise this could be. Chuck Berry: The Complete Discography, 1955-1964.